BAJA 500 UPDATES!! LIVE!! Pre-Running Reports show ANIMAL HOUSE fantasy race creator Mike Overcast continues stealing - same old, same old one has to say - 98% of his so called "reporting" and updates are stolen content from either the race Dezert Forum or other websites as you can see by screen shot below. 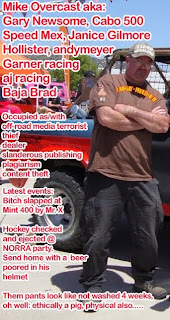 Simple said: NoMonster Mike Reports from Baja Mexico on BAJA 500 Pre-Run are stolen goods. We understand now somewhat why his latest personal insults against members of checkers which he titled "a bunch of fat drunks" and the president of this 30+ years off-road entity a "doofus". First of all he stole the logo from them and "re-modeled" it Mike Overcast scumbag style and use it for one of his wannabe websites. Them guys sure don't send him xmas cards for that - would you??? They are not happy about it yet cant do anything for now. Additional some people went into his face at the NORRA party in Mexicali, Mr. Y even checked him hockey style! :-). he had a beer emptied in his golden helmet he was caring for the road and send home. In other words he got ejected from the party. So was his "personal assistant / "body guard" wearing school uniform and braces on his teeth.